죽은 자가 지옥에서 벗어나 극락왕생할 것을 빌기 위해 만든 감로탱화인데, 탱화란 천이나 종이에 불화를 그려 족자나 액자형태로 만들어 걸 수 있게 한 불교그림을 말한다. 조선 중기 이후 우리나라에서 불교와 유교의 효가 결합된 형태로 많이 그려졌다. 이 감로탱화는 배경이 산수화풍이며 3단으로 구성되어 있다. 상단에는 부처가 있는 이상세계를 표현하였고, 중단에는 제사상과 굶어 죽어가는 시아귀에게 불교 의례를 하는 모습이 있다. 하단에는 지옥, 아귀 등 윤회세계를 나타내고 있다. 그림의 상단 중심부에는 석가, 비로자나불, 노사나불의 삼신불과 칠불이 배치되어 있다. 일반적인 감로탱화에서는 삼신불을 생략하는 편이지만 이 탱화에서는 화엄사상의 영향으로 삼신불이 나타난다. 중단 중심부에는 제사상과 의례를 지내는 승려가 있고 그 아래 시아귀의 모습이 표현되어 있으며 제사상 위에는 번개와 금줄로 신성한 구역을 구분하였다. 의례를 지내는 승려 옷의 색이나 북, 방울 등의 표현에서 당시 의례에 대한 자료를 파악할 수 있다. 숙종 7년(1681)에 제작된 이 감로탱화는 국립중앙박물관 소장 감로탱화(1649)에 이어 두번째로 오래된 작품이며, 산수화적 배경 묘사는 조선시대 불화의 특징으로 조선 중기, 후기 감로탱화 연구에 중요한 자료이다. 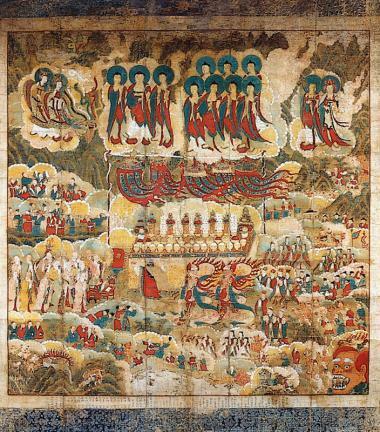 Taenghwa refers to a Buddhist painting painted on cloth or paper and hung on the wall after being framed. Gamno taenghwa (Painting of Buddha Giving a Sermon) refers to a kind of taenghwa, which is painted to pray for the dead and for their safe trip to the Pure Land. Many taenghwa drawn since the mid-Joseon Dynasty reflect the combination of Buddhism and Confucianism, particularly filial duty. This three-level painting has a landscape painting as its background. The top part depicts the ideal world where Buddha exists. The middle part portrays the scene of Buddhist ritual for a starving ghost and the table setting for the ritual. 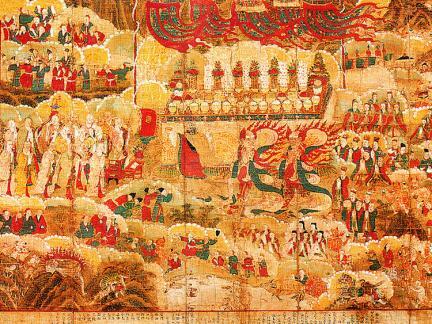 The lower part of the painting features the world of samsara and continuous cycle of life, death, and reincarnation, including hell and starving demon. 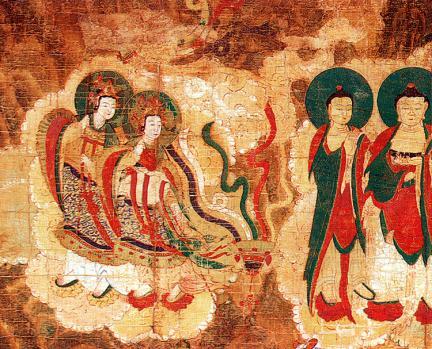 The upper center part of the painting depicts three Buddhist gods (Sakyamuni, Vairocana Buddha, Nosana Buddha) as well as the seven Buddhist gods. 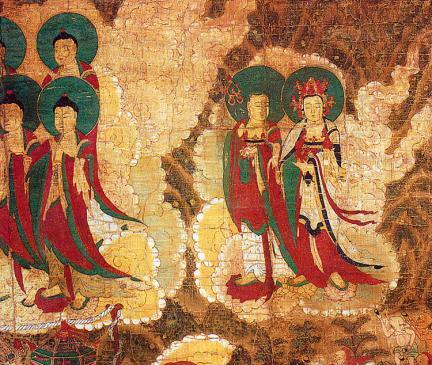 Generally, the three Buddhist gods do not appear in Gamno taenghwa, but this painting depicts them under the influence of Hwaeomjong, a sect of Buddhism. The middle center part portrays the scene of monks holding a ritual as well as the starving ghosts under them. There is a specially set table for the ritual. Lightning and gold lines mark the sacred areas on the table. 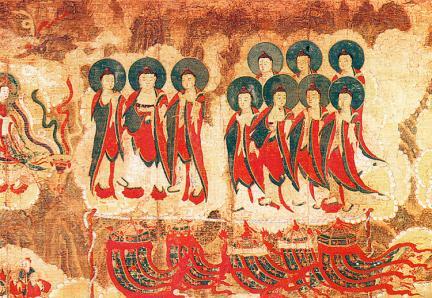 The colors of the robes of the monks leading the ritual and the drum and bells, which are portrayed in the painting, provide information about the rituals of that time. Made in the 7th year of the reign of King Sukjong (1681) of the Joseon Dynasty, this painting is the second oldest Gamno taenghwa in Korea, following the one in the National Museum of Korea, which was painted in 1649. The landscape background is typical among the Buddhist paintings in the Joseon Dynasty. The painting provides important information in studying Gamno taenghwa paintings from the mid- and late Joseon Dynasty.